Colorado, take note: Michele Battiste will read from her upcoming collection Uprising (it’s so, so good) at the Bouldering Poets reading series on Saturday, May 18 in Boulder. Don’t miss it! 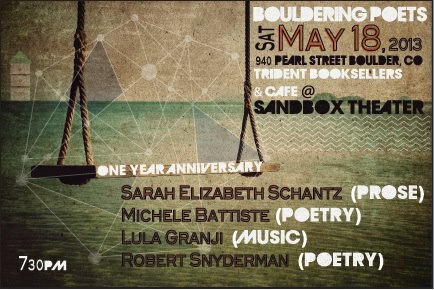 Sarah Elizabeth Schantz and Robert Snyderman will also be reading along with music from Lula Granji.